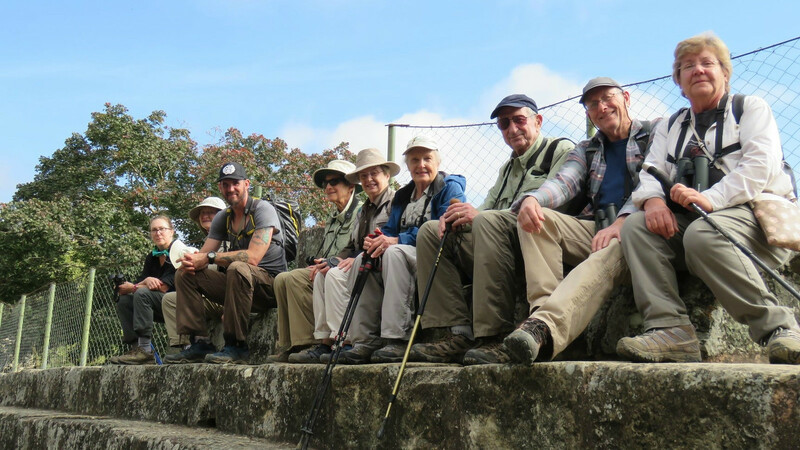 Our fun group on the steps in the ruins at Copan. Thanks to Alex for the nice photo. Thanks for spending the holidays with me in Honduras. I really enjoyed showing you the country and hope you have fond memories of our trip together. Thanks to Alex Alvarado for his excellent guiding and, of course, to our driver and local staff. All the best for a birdy 2019! BLACK-BELLIED WHISTLING-DUCK (Dendrocygna autumnalis) – The two species of whistling-duck were seen at Lake Yojoa. The most common were Black-bellied, but there was a sprinkling of Fulvous, too. MUSCOVY DUCK (Cairina moschata) – We saw at least three wild ducks feeding in the in-shore vegetation at Lake Yojoa. BLUE-WINGED TEAL (Spatula discors) – Large numbers at Lake Yojoa. AMERICAN WIGEON (Mareca americana) – Equal number of wigeon wintering on Lake Yojoa as with the previous species. RING-NECKED DUCK (Aythya collaris) – A small group of 25 or so was seen from our lunch spot Rancho Bella Vista at Lake Yojoa. LESSER SCAUP (Aythya affinis) – 200+ individuals were seen on Lake Yojoa. A winter visitor to Honduras. PLAIN CHACHALACA (Ortalis vetula) – Seen around the shores of Lake Yojoa at La Naturaleza. LEAST GREBE (Tachybaptus dominicus) – One was seen on Lake Yojoa from Finca Las Glorias. PIED-BILLED GREBE (Podilymbus podiceps) – Small numbers on Lake Yojoa. WOOD STORK (Mycteria americana) – A couple of different groups were seen soaring above us. 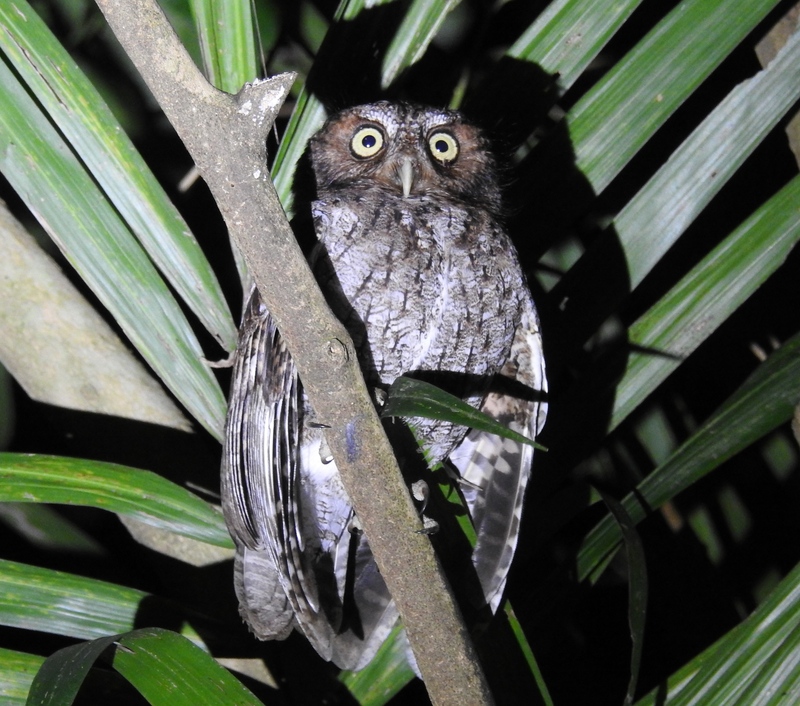 This Guatemalan Screech-Owl (or Middle American Screech-Owl) was seen super well on the hotel grounds in La Ceiba. Photo by guide Jesse Fagan. MAGNIFICENT FRIGATEBIRD (Fregata magnificens) – One was seen soaring over the Caribbean Sea at Cuero y Salado. NEOTROPIC CORMORANT (Phalacrocorax brasilianus) – Good numbers along the North Coast. ANHINGA (Anhinga anhinga) – Three at Cuero y Salado. BROWN PELICAN (Pelecanus occidentalis) – A pair were at the mouth of the river at Cuero y Salado. BARE-THROATED TIGER-HERON (Tigrisoma mexicanum) – Awesome looks at close birds during our boat ride at Cuero y Salado. GREAT BLUE HERON (Ardea herodias) – Small numbers wintering on Lake Yojoa. GREAT EGRET (Ardea alba) – The next three species were quite common on the north coast and Lake Yojoa. Seen in good numbers. TRICOLORED HERON (Egretta tricolor) – Small numbers around Lake Yojoa. CATTLE EGRET (Bubulcus ibis) – Common in our travels of Honduras. GREEN HERON (Butorides virescens) – Seen at Cuero y Salado (where common) and again at Lake Yojoa. YELLOW-CROWNED NIGHT-HERON (Nyctanassa violacea) – Seen super well from our small boat at Cuero y Salado. BOAT-BILLED HERON (Cochlearius cochlearius) – Always a treat to see. This bird has such an odd bill which it uses to hunt crabs and break snail shells at night. BLACK VULTURE (Coragyps atratus) – Both Black and Turkey vultures were common and seen everyday of the tour. LESSER YELLOW-HEADED VULTURE (Cathartes burrovianus) – Seen super well (and low) from the boat at Cuero y Salado. 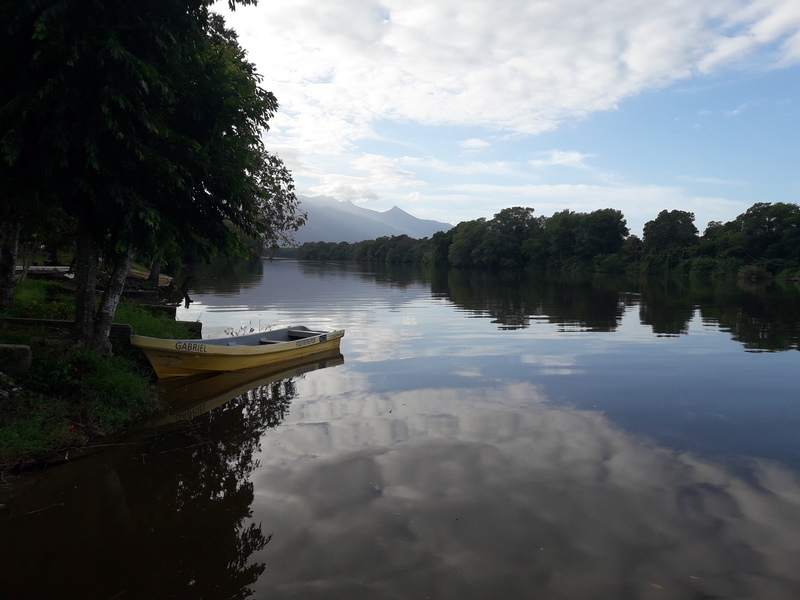 One of our first birding spots on the north coast was at Cuero y Salado NWR for a morning boat ride in the mangroves. The majestic Cordillera Nombre de Dios tower in the background. Photo by guide Jesse Fagan. OSPREY (Pandion haliaetus) – One at Cuero y Salado. SNAIL KITE (Rostrhamus sociabilis) – Seems their numbers have increased considerably at Lake Yojoa again after a dip in their numbers the past few years (due to fluctuations in apple snail numbers no doubt). COMMON BLACK HAWK (Buteogallus anthracinus) – One adult was seen at Cuero y Salado. ROADSIDE HAWK (Rupornis magnirostris) – Good numbers around La Ceiba and again in Copan. GRAY HAWK (Buteo plagiatus) – Seen nicely in the scope at Lancetilla Botanical Gardens. BROAD-WINGED HAWK (Buteo platypterus) – Seen at Santa Barbara and Copan. SHORT-TAILED HAWK (Buteo brachyurus) – Also seen at Santa Barbara, but our first was a light-morph at El Rancho. ZONE-TAILED HAWK (Buteo albonotatus) – Nice looks at a pair soaring over the mangroves at Cuero y Salado. RED-TAILED HAWK (Buteo jamaicensis) – The resident subspecies was seen well at El Rancho and La Laguna. Birds here show little belly band and dark throats. A mix of Eastern and Western type characteristics. PURPLE GALLINULE (Porphyrio martinica) – Small numbers of both gallinules were seen at Lake Yojoa. AMERICAN COOT (Fulica americana) – Large numbers on Lake Yojoa. SUNGREBE (Heliornis fulica) – Very cool to see a male and female so well at Cuero y Salado. 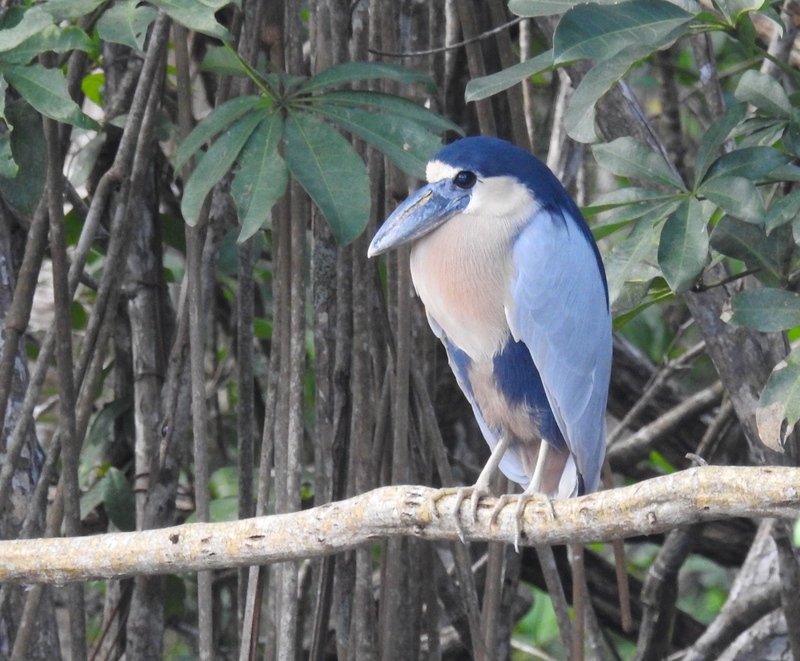 At Cuero y Salado we were treated to fantastic views of the odd Boat-billed Heron. Photo by guide Jesse Fagan. LIMPKIN (Aramus guarauna) – One at Lake Yojoa. One of John's favorite birds! BLACK-NECKED STILT (Himantopus mexicanus) – A group of 15 were along the shore at Finca Las Glorias. BLACK-BELLIED PLOVER (Pluvialis squatarola) – One on the river mouth at Cuero y Salado. COLLARED PLOVER (Charadrius collaris) – We finally found our target bird at the mouth of the river at Cuero y Salado. Always a treat to see this species. SEMIPALMATED PLOVER (Charadrius semipalmatus) – A pair were on the beach at Cuero y Salado. NORTHERN JACANA (Jacana spinosa) – Good numbers on the train ride to CyS and again at Lake Yojoa. RUDDY TURNSTONE (Arenaria interpres) – The next three species of shorebirds were seen on the river mouth beach at Cuero y Salado. ROYAL TERN (Thalasseus maximus) – A mixed tern flock at the CyS river mouth was composed of this species and the next. PALE-VENTED PIGEON (Patagioenas cayennensis) – Seen most days on the north coast. RED-BILLED PIGEON (Patagioenas flavirostris) – Several in the Copan area. SHORT-BILLED PIGEON (Patagioenas nigrirostris) – A pair were feeding on fruit near the PANACAM tower. INCA DOVE (Columbina inca) – Fairly common on the north coast. The "no hope" call. RUDDY GROUND-DOVE (Columbina talpacoti) – Also, common on north coast and Lake Yojoa area. BLUE GROUND-DOVE (Claravis pretiosa) – Often heard, but more difficult to see. We saw them in flight at Lancetilla. WHITE-WINGED DOVE (Zenaida asiatica) – The most common dove seen on the tour. Seen everyday. GROOVE-BILLED ANI (Crotophaga sulcirostris) – Seen most days especially along the north coast and Lake Yojoa in cutover areas. LESSER ROADRUNNER (Geococcyx velox) – One was seen at El Rancho singing away (if you call that singing!). 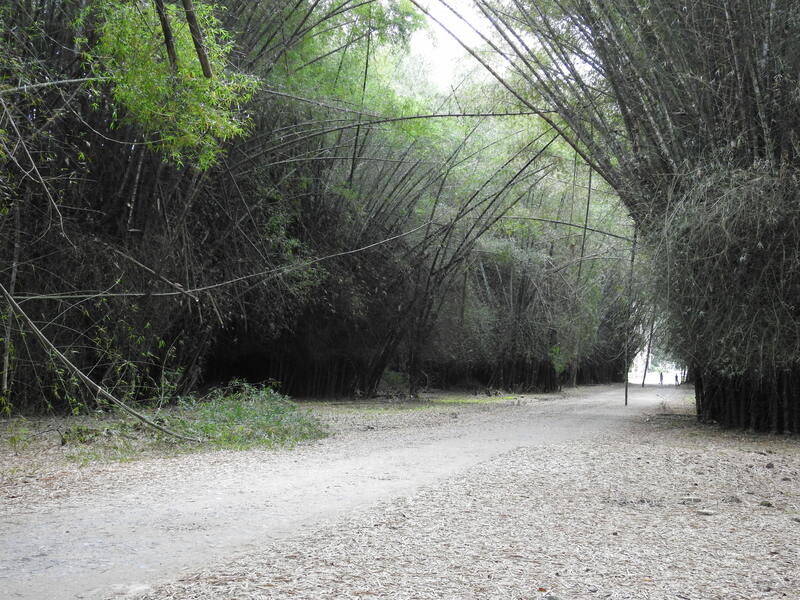 We had an awesome birding morning at Lancetilla Botanical Gardens where we also made the Bamboo Walk. Photo by guide Jesse Fagan. SQUIRREL CUCKOO (Piaya cayana) – Seen or heard nearly everyday of the tour. BARN OWL (Tyto alba) – One was flushed out of the marsh along Lake Yojoa during the day. VERMICULATED SCREECH-OWL (Megascops guatemalae) – Awesome looks at night, but again as a day-singing bird at Los Naranjos. FERRUGINOUS PYGMY-OWL (Glaucidium brasilianum) – Seen or heard around Lake Yojoa and Los Naranjos, plus El Rancho. MOTTLED OWL (Ciccaba virgata) – Heard near La Ceiba, but we called one up at PANACAM (at the reservoir). COMMON PAURAQUE (Nyctidromus albicollis) – Alexander nearly stepped right on them before they flushed! WHITE-COLLARED SWIFT (Streptoprocne zonaris) – Seen in big, soaring flocks over Lancetilla. VAUX'S SWIFT (Chaetura vauxi) – Just a couple over the ruins at Copan. WHITE-NECKED JACOBIN (Florisuga mellivora) – Lots at the Rio Santiago feeders. LONG-BILLED HERMIT (Phaethornis longirostris) – A few at the Rio Santiago feeders and again lekking at Lancetilla. STRIPE-THROATED HERMIT (Phaethornis striigularis) – Singles seen on most days. This is the tiniest of the NCA hermits. PLAIN-CAPPED STARTHROAT (Heliomaster constantii) – Seen in Copan near our hotel. GREEN-THROATED MOUNTAIN-GEM (Lampornis viridipallens) – A couple of these (an NCA endemic) were seen at Santa Barbara NP. CANIVET'S EMERALD (SALVIN'S) (Chlorostilbon canivetii salvini) – A female was in the dry forest near our hotel in Copan. EMERALD-CHINNED HUMMINGBIRD (Abeillia abeillei) – An excellent bird to see. One was feeding on wildflowers at Santa Barbara. SCALY-BREASTED HUMMINGBIRD (Phaeochroa cuvierii) – Several at Rio Santiago feeders. VIOLET SABREWING (Campylopterus hemileucurus) – Seen at Rio Santiago and again at PANACAM. CROWNED WOODNYMPH (Thalurania colombica) – Seen at Rio Santiago. These are the "violet-crowned" types. WHITE-BELLIED EMERALD (Amazilia candida) – Common at the PANACAM feeders. Honduran Emerald is a rare and local endemic that we had the opportunity to see near El Rancho. This species was thought to be extinct until its rediscovery in 1988. Video by guide Jesse Fagan. AZURE-CROWNED HUMMINGBIRD (Amazilia cyanocephala) – Good numbers at El Rancho and Copan. They prefer the more semi-arid habitats. BERYLLINE HUMMINGBIRD (SUMICHRAST'S) (Amazilia beryllina devillei) – Three seen at the El Rancho restaurant feeders. RUFOUS-TAILED HUMMINGBIRD (Amazilia tzacatl) – Common at most hummingbird feeders on the north coast. CINNAMON HUMMINGBIRD (Amazilia rutila) – Singles around Lake Yojoa. BLACK-HEADED TROGON (Trogon melanocephalus) – Small numbers seen on the north coast. GARTERED TROGON (Trogon caligatus) – Seen a couple of times at El Rancho. COLLARED TROGON (Trogon collaris) – A female was seen at Santa Barbara NP. LESSON'S MOTMOT (Momotus lessonii lessonii) – Quite common around Lake Yojoa and several around the cabins at PANACAM. KEEL-BILLED MOTMOT (Electron carinatum) – The star of the show was seen nicely from the parking lot at PANACAM. Rare and local in Central America. The Turquoise-browed Motmot is quite possibly the coolest bird ever. ;-) Photo by guide Jesse Fagan (aka Motmot). 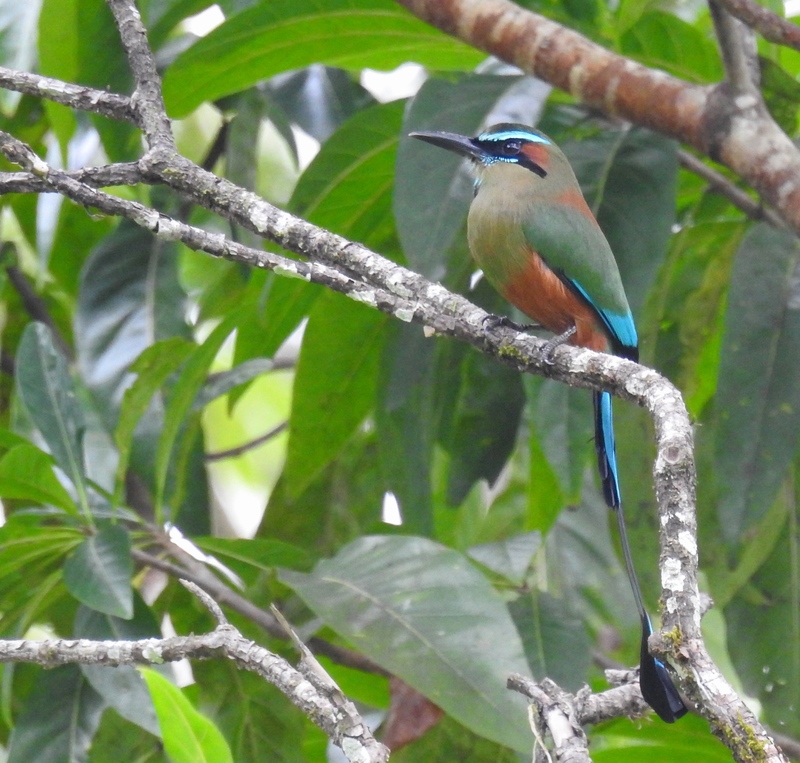 TURQUOISE-BROWED MOTMOT (Eumomota superciliosa) – The best looking motmot of them all? ;-) National bird of El Salvador. RINGED KINGFISHER (Megaceryle torquata) – We swept all the possible kingfishers on this tour (!) including very nice looks at American Pygmy at Cuero y Salado. 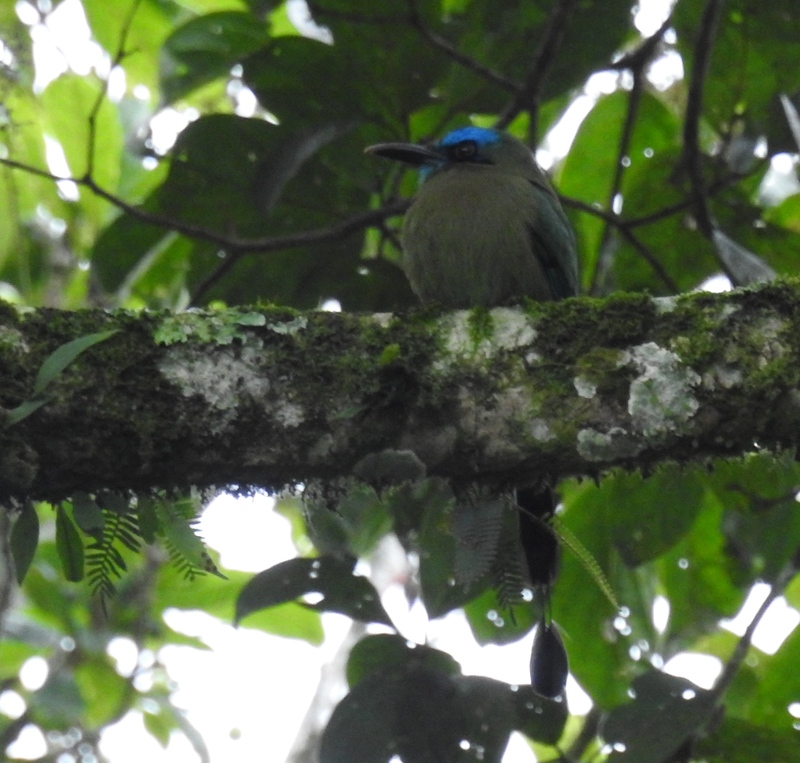 By far one of the rarest, most difficult birds we encountered was the Keel-billed Motmot. This individual was photographed by Jesse Fagan in the parking lot at PANACAM! RUFOUS-TAILED JACAMAR (Galbula ruficauda) – Seen at Lancetilla Botanical Gardens, but hearing one at La Naturaleza (Lake Yojoa) was a new record for the Sula Valley. NORTHERN EMERALD-TOUCANET (Aulacorhynchus prasinus) – One was seen on our last day of birding near Copan. COLLARED ARACARI (Pteroglossus torquatus) – Good numbers at Lancetilla and La Naturaleza. KEEL-BILLED TOUCAN (Ramphastos sulfuratus) – The "croakers" were heard more often than seen, but still a common bird throughout Honduras. OLIVACEOUS PICULET (Picumnus olivaceus) – Good numbers at Lancetilla. ACORN WOODPECKER (Melanerpes formicivorus) – Common at El Rancho in the pine-oak forest. BLACK-CHEEKED WOODPECKER (Melanerpes pucherani) – Seen on the north coast. GOLDEN-FRONTED WOODPECKER (VELASQUEZ'S) (Melanerpes aurifrons santacruzi) – A potential split of this taxon is forthcoming. These from NCA would be Valasquez's Woodpecker. SMOKY-BROWN WOODPECKER (Picoides fumigatus) – Seen well at Lancetilla Botanical Gardens near Tela. GOLDEN-OLIVE WOODPECKER (Colaptes rubiginosus) – Very common from Lake Yojoa south to Copan. LINEATED WOODPECKER (Dryocopus lineatus) – Always a guide favorite. BARRED FOREST-FALCON (Micrastur ruficollis) – One was seen briefly (heard by all!) at Santa Barbara NP. Always tough to see this forest raptor. CRESTED CARACARA (Caracara cheriway) – Seen several times on the north coast and again near Copan. LAUGHING FALCON (Herpetotheres cachinnans) – Heard "laughing" at several places, but it was seen well in the scope at El Rancho. AMERICAN KESTREL (Falco sparverius) – Singles on a couple of days. BAT FALCON (Falco rufigularis) – One was perched on the cell tower over Rio Santiago. No doubt waiting for the first bats to emerge at dusk. BROWN-HOODED PARROT (Pyrilia haematotis) – A group of 10 flew by at Lancetilla. RED-LORED PARROT (Amazona autumnalis) – Common on the north coast. WHITE-FRONTED PARROT (Amazona albifrons) – Small numbers around Lake Yojoa and Copan. The "small" Amazon parrot. OLIVE-THROATED PARAKEET (Eupsittula nana) – Now split by some authorities as "Aztec Parakeet." Seen in good numbers on the north coast. SCARLET MACAW (Ara macao) – Reintroduced to the Copan area, but we include it on the list b/c they are free-flying "wild" parrots and, hey, it's a macaw! GREEN PARAKEET (RED-THROATED) (Psittacara holochlorus rubritorquis) – A real treat was seeing large numbers of this taxon in the Copan ruins. 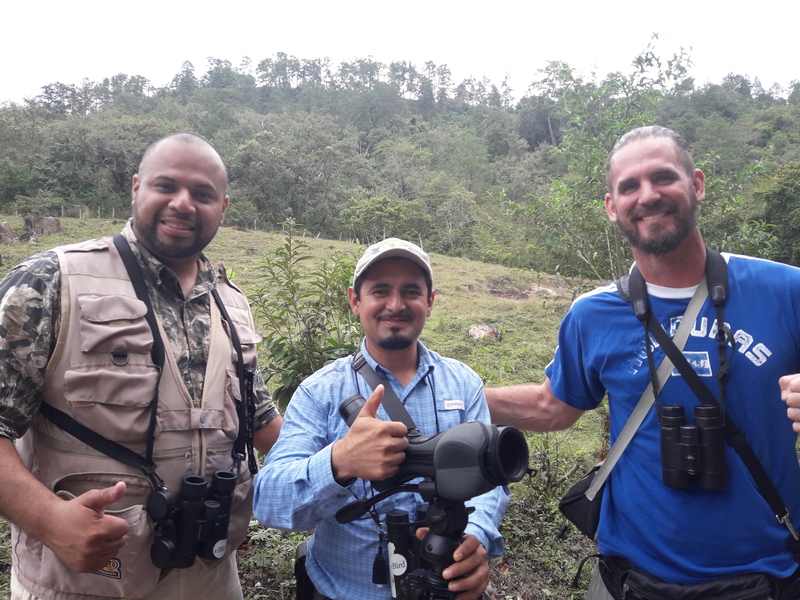 Your happy guides birding the El Rancho area. GREAT ANTSHRIKE (Taraba major) – Seen at El Rancho. BARRED ANTSHRIKE (Thamnophilus doliatus) – Heard or seen at several sites during the tour. BLACK-CROWNED ANTSHRIKE (Thamnophilus atrinucha) – A pair were seen in the mangroves at Cuero y Salado. NORTHERN BARRED-WOODCREEPER (Dendrocolaptes sanctithomae) – Awesome looks at Lancetilla and Los Naranjos. STRONG-BILLED WOODCREEPER (Xiphocolaptes promeropirhynchus) – A pair were watched close in the pine-oak forest above Copan. IVORY-BILLED WOODCREEPER (Xiphorhynchus flavigaster) – This species was seen at Los Naranjos. STREAK-HEADED WOODCREEPER (Lepidocolaptes souleyetii) – Good numbers at Lancetilla and Lake Yojoa. The common small woodcreeper in the hot lowlands. PLAIN XENOPS (Xenops minutus) – Two were seen at Cuero y Salado. RUFOUS-BREASTED SPINETAIL (Synallaxis erythrothorax) – A good bird to find and see well. We had a pair in the scrubby vine tangles at Lancetilla. They were very responsive. YELLOW-BELLIED TYRANNULET (Ornithion semiflavum) – This tiny canopy tyrannulet was seen at Lancetilla. NORTHERN BEARDLESS-TYRANNULET (Camptostoma imberbe) – Super common in the mangroves of Cuero y Salado. YELLOW-BELLIED ELAENIA (Elaenia flavogaster) – One was found at Los Naranjos. OCHRE-BELLIED FLYCATCHER (Mionectes oleagineus) – Small numbers in the Lake Yojoa area. NORTHERN BENTBILL (Oncostoma cinereigulare) – The small flycatcher which really does have a bent bill! COMMON TODY-FLYCATCHER (Todirostrum cinereum) – Indeed, "common" at several spots along the tour. 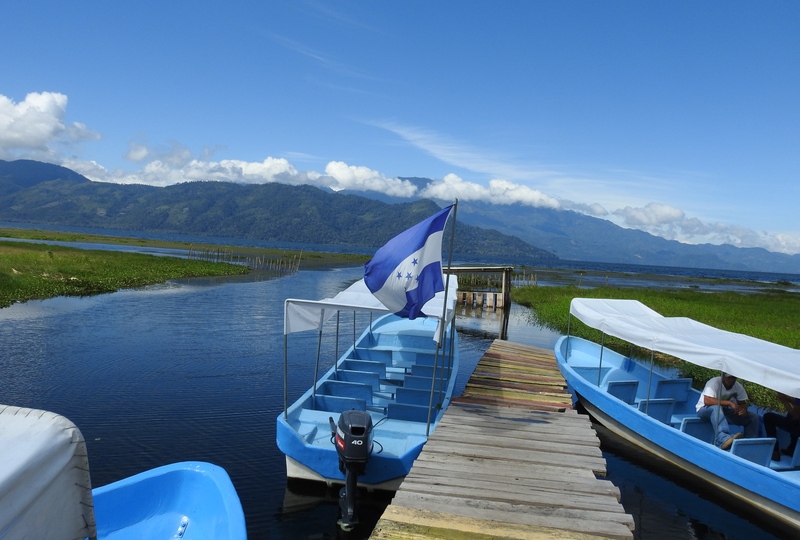 We birded several sites around the gorgeous Lake Yojoa including the mountains in the background, Santa Barbara NP. Photo by guide Jesse Fagan. GREATER PEWEE (Contopus pertinax) – One was seen well at La Laguna. "Jose Mariaaa!" TROPICAL PEWEE (Contopus cinereus) – This resident pewee was seen at La Naturaleza. YELLOW-BELLIED FLYCATCHER (Empidonax flaviventris) – Super common as a winter visitor. WILLOW FLYCATCHER (Empidonax traillii) – One was seen at La Naturaleza. An uncommon winter visitor to NCA. WHITE-THROATED FLYCATCHER (Empidonax albigularis) – A very good bird to find. They breed at Lake Yojoa. LEAST FLYCATCHER (Empidonax minimus) – Seen well a number of times around Lake Yojoa and Copan. Always giving a soft 'whit' call. YELLOWISH FLYCATCHER (Empidonax flavescens) – Seen at La Laguna near Copan. BLACK PHOEBE (Sayornis nigricans) – Singles over three days. Almost always near water. BRIGHT-RUMPED ATTILA (Attila spadiceus) – One was seen at Rio Santiago on the north coast. DUSKY-CAPPED FLYCATCHER (Myiarchus tuberculifer) – Most days on tour. GREAT CRESTED FLYCATCHER (Myiarchus crinitus) – Its "wheeek" call was a daily sound. BROWN-CRESTED FLYCATCHER (Myiarchus tyrannulus) – One was near our hotel in Copan. GREAT KISKADEE (Pitangus sulphuratus) – The next four 'yellow-bellied' flycatcher species were seen nearly every day and in good numbers. FORK-TAILED FLYCATCHER (Tyrannus savana) – Always a treat to see this species. We had several over the Lake Yojoa edge at Bella Vista. 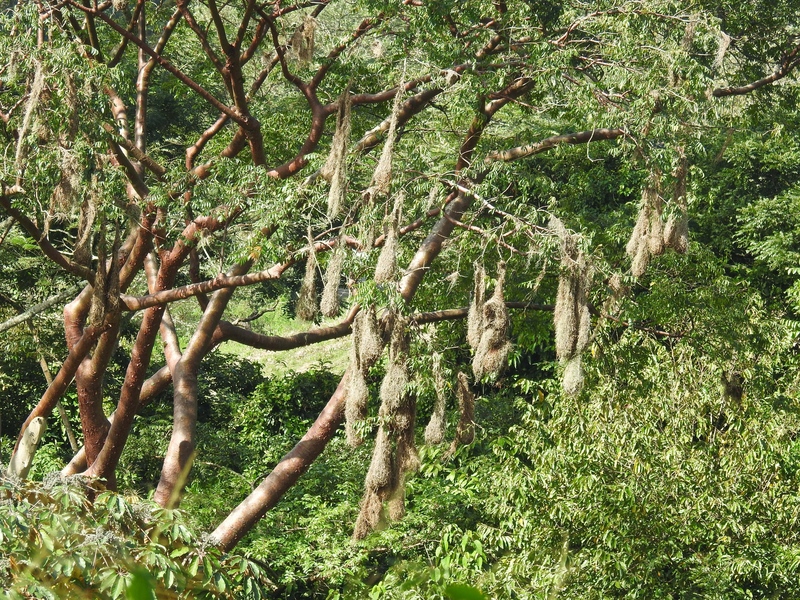 Montezuma Oropendola nests hang from a gumbo limbo tree at La Naturaleza. Photo by guide Jesse Fagan. WHITE-COLLARED MANAKIN (Manacus candei) – Seen (or heard snapping!) at several sites around Lake Yojoa and Lancetilla. RED-CAPPED MANAKIN (Ceratopipra mentalis) – A few folks saw this species at Lancetilla. MASKED TITYRA (Tityra semifasciata) – Good numbers seen at Lake Yojoa and Copan. ROSE-THROATED BECARD (Pachyramphus aglaiae) – The variety around Lake Yojoa and Lancetilla are gray-bodied, but lack the pink throat. The subspecies here is hypophaeus. LESSER GREENLET (Pachysylvia decurtata) – Common at Lake Yojoa region. WHITE-EYED VIREO (Vireo griseus) – Responsive to most pygmy-owl calls. A common winter visitor on the north coast. YELLOW-THROATED VIREO (Vireo flavifrons) – Seen a number of times around Lake Yojoa and Lancetilla. BLUE-HEADED VIREO (Vireo solitarius) – One was in the pine-oak forest at La Laguna. This species winters in the NCA highlands. PHILADELPHIA VIREO (Vireo philadelphicus) – Nice to see so many on their wintering grounds. BROWN JAY (Psilorhinus morio) – Common on this tour. GREEN JAY (Cyanocorax yncas) – Seen at El Rancho. BUSHY-CRESTED JAY (Cyanocorax melanocyaneus) – This NCA endemic was seen at Santa Barbara and in the Copan area. NORTHERN ROUGH-WINGED SWALLOW (Stelgidopteryx serripennis) – Ranges throughout Honduras. GRAY-BREASTED MARTIN (Progne chalybea) – A small number were around La Naturaleza and Lake Yojoa. TREE SWALLOW (Tachycineta bicolor) – Small numbers at Los Naranjos and at Copan ruins. MANGROVE SWALLOW (Tachycineta albilinea) – Just one at Lake Yojoa (Los Naranjos). BARN SWALLOW (AMERICAN) (Hirundo rustica erythrogaster) – Seen near La Ceiba and again further south around Lake Yojoa and Copan. HOUSE WREN (SOUTHERN) (Troglodytes aedon musculus) – Heard or seen nearly every day of the tour. RUFOUS-NAPED WREN (Campylorhynchus rufinucha) – Seen at Los Naranjos and in the Copan area. SPOT-BREASTED WREN (Pheugopedius maculipectus) – Quite vocal (heard most days), but seen well a few times in the vine tangles. RUFOUS-AND-WHITE WREN (Thryophilus rufalbus) – One was seen at Los Naranjos. Beautiful song. CABANIS'S WREN (Cantorchilus modestus) – A dueting wren that is loud and vocal. Always a bit of a challenge to see well. WHITE-BREASTED WOOD-WREN (Henicorhina leucosticta) – Common on this tour, at least by voice. 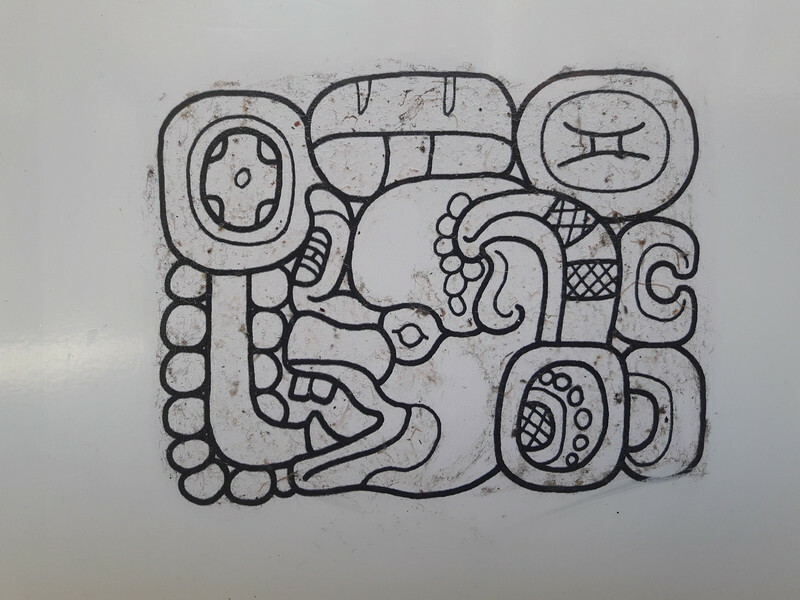 The Mayan symbol for the site of Copan was the leaf-nosed bat. Photo by guide Jesse Fagan. LONG-BILLED GNATWREN (Ramphocaenus melanurus) – At least three were observed at Lancetilla Botanical Gardens. BLUE-GRAY GNATCATCHER (Polioptila caerulea) – Wintering birds were seen in the dry forest near our Copan hotel. WOOD THRUSH (Hylocichla mustelina) – NCA is the core wintering area of this species. CLAY-COLORED THRUSH (Turdus grayi) – Everday. National bird of Costa Rica. GRAY CATBIRD (Dumetella carolinensis) – Heard "meowing" most days around Lake Yojoa. Seen a number of times. TROPICAL MOCKINGBIRD (Mimus gilvus) – One near La Ceiba was strangely our only one. WORM-EATING WARBLER (Helmitheros vermivorum) – Always good to see this one. NORTHERN WATERTHRUSH (Parkesia noveboracensis) – Good numbers at Cuero y Salado, but seen on other days, too. Prefers slow moving waters (as on its breeding grounds). GOLDEN-WINGED WARBLER (Vermivora chrysoptera) – One female was seen at Cuero y Salado. BLUE-WINGED WARBLER (Vermivora cyanoptera) – Small numbers encountered on the tour. BLACK-AND-WHITE WARBLER (Mniotilta varia) – Seen most days on tour. TENNESSEE WARBLER (Oreothlypis peregrina) – Common at Lancetilla and other sites. GRAY-CROWNED YELLOWTHROAT (Geothlypis poliocephala) – Seen well at El Rancho. MACGILLIVRAY'S WARBLER (Geothlypis tolmiei) – A pair were at Santa Barbara NP. This species winters in the highlands. KENTUCKY WARBLER (Geothlypis formosa) – Several at Los Naranjos. COMMON YELLOWTHROAT (Geothlypis trichas) – Very common as a wintering bird around Lake Yojoa and Copan. HOODED WARBLER (Setophaga citrina) – The next two species are common winter visitors to NCA. Seen most days on tour in good numbers. NORTHERN PARULA (Setophaga americana) – Slightly less common than the previous species, but seen on several days. MAGNOLIA WARBLER (Setophaga magnolia) – Another very common winter visitor in NCA. YELLOW WARBLER (NORTHERN) (Setophaga petechia aestiva) – The "northern" migrant variety of Yellow Warbler was encountered most days. CHESTNUT-SIDED WARBLER (Setophaga pensylvanica) – Common winter visitor. Seen most days. YELLOW-THROATED WARBLER (Setophaga dominica) – The individuals wintering in NCA have white supralorals, which is the albilora subspecies from west of the Appalachian mountains. GRACE'S WARBLER (Setophaga graciae) – Seen in the pine forest above Copan. BLACK-THROATED GREEN WARBLER (Setophaga virens) – Good numbers at El Rancho and again around Copan. RUFOUS-CAPPED WARBLER (CHESTNUT-CAPPED) (Basileuterus rufifrons delattrii) – One was seen at El Rancho in the pine-oak forest, but also again near our hotel in Copan. WILSON'S WARBLER (Cardellina pusilla) – Common in the drier highlands. PAINTED REDSTART (Myioborus pictus) – A good one to see in NCA. One was found at La Laguna. SLATE-THROATED REDSTART (Myioborus miniatus) – A pair were seen at Santa Barbara NP. 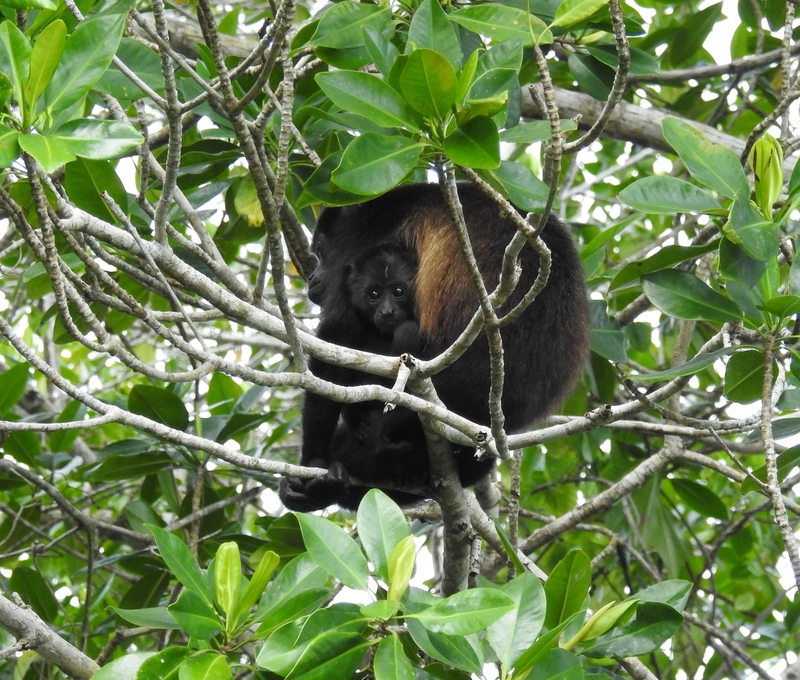 A parting shot of the adult Mantled Howler Monkey with a young one hanging on in the mangroves at Cuero y Salado. Photo by guide Jesse Fagan. CRIMSON-COLLARED TANAGER (Ramphocelus sanguinolentus) – Small numbers were seen on several days. This is a sharp looking tanager! PASSERINI'S TANAGER (Ramphocelus passerinii) – Liked by most in the group. The velvet black bird with a blood red rump. BLUE-GRAY TANAGER (Thraupis episcopus) – Seen on the north coast and around Lake Yojoa in small numbers. YELLOW-WINGED TANAGER (Thraupis abbas) – Like Blue-gray, around in most places. Seen well at Lake Yojoa. GOLDEN-HOODED TANAGER (Tangara larvata) – There are not many Tangara tanagers in NCA (unlike South America), but we saw this genus at Los Naranjos and PANACAM. GREEN HONEYCREEPER (Chlorophanes spiza) – At least five individuals were observed at La Naturaleza on the shores of Lake Yojoa. VARIABLE SEEDEATER (Sporophila corvina) – Named for the variable plumage throughout its range, this scrubby vegetation bird was seen in around Lake Yojoa and El Rancho. In NCA, they are all black with a small white handkerchief. WHITE-COLLARED SEEDEATER (Sporophila torqueola) – This species has been split. It is now called Morelet's Seedeater (S. morelleti). BUFF-THROATED SALTATOR (Saltator maximus) – All three saltators were encountered on the tour. Most common (with the electric chatter) was Black-headed. COMMON CHLOROSPINGUS (Chlorospingus flavopectus) – Three were in the highlands at Santa Barbara. GREEN-BACKED SPARROW (Arremonops chloronotus) – This NCA endemic was seen high up in the trees at Los Naranjos. We had it in the scope for a long time. WHITE-FACED GROUND-SPARROW (Melozone biarcuata) – A very nice looking Melozone that we saw skulking around at Santa Barbara NP. RUSTY SPARROW (Aimophila rufescens) – This species was seen in the scrubby vegetation at El Rancho. WHITE-NAPED BRUSHFINCH (YELLOW-THROATED) (Atlapetes albinucha fuscipygius) – A pair were at Santa Barbara NP. YELLOW-BREASTED CHAT (Icteria virens) – One showed well across the small stream at Lancetilla Botanical Gardens. HEPATIC TANAGER (Piranga flava) – Seen in the drier forest at El Rancho and Copan. SUMMER TANAGER (Piranga rubra) – Very common as a winter visitor in NCA. RED-THROATED ANT-TANAGER (Habia fuscicauda) – Good numbers around Lake Yojoa in the humid forest. ROSE-BREASTED GROSBEAK (Pheucticus ludovicianus) – We had a pair in the small forest patch around the hotel in San Pedro Sula. PAINTED BUNTING (Passerina ciris) – A male and female were seen near our hotel in Copan. EASTERN MEADOWLARK (Sturnella magna) – A pair at the airport in San Pedro Sula. CHESTNUT-HEADED OROPENDOLA (Psarocolius wagleri) – Common in the Copan area. MONTEZUMA OROPENDOLA (Psarocolius montezuma) – Seen most days on tour. ORCHARD ORIOLE (Icterus spurius) – A winter flock was foraging near our hotel in San Pedro Sula. YELLOW-BACKED ORIOLE (Icterus chrysater) – One was seen at El Rancho. STREAK-BACKED ORIOLE (STREAK-BACKED) (Icterus pustulatus sclateri) – The subspecies in NCA has a nearly all black back, which can be confusing with the next two species. SPOT-BREASTED ORIOLE (Icterus pectoralis) – A pair (look for the white triangle in the wing!) was seen at El Rancho. ALTAMIRA ORIOLE (Icterus gularis) – Of the resident orioles in NCA, this species was by far the most common. BALTIMORE ORIOLE (Icterus galbula) – Common as a winter visitor in the Lake Yojoa area and even at our hotel in San Pedro Sula. BRONZED COWBIRD (Molothrus aeneus) – A small group of 6 flew by at Los Naranjos. MELODIOUS BLACKBIRD (Dives dives) – Both this species and the next were seen everyday. SCRUB EUPHONIA (Euphonia affinis) – Small numbers at Lancetilla and El Rancho. Its call is a distinctive "deet deet." YELLOW-THROATED EUPHONIA (Euphonia hirundinacea) – Common around Lake Yojoa at various sites. ELEGANT EUPHONIA (Euphonia elegantissima) – We watched a close group feeding on mistletoe berries at La Laguna. BLACK-HEADED SISKIN (Spinus notatus) – A pair were seen at La Laguna above Copan. LESSER GOLDFINCH (Spinus psaltria) – A group of six birds was seen at the hotel in San Pedro Sula. VIRGINIA OPOSSUM (Didelphis virginianus) – One crossed the entrance road to our hotel in La Ceiba. MANTLED HOWLER MONKEY (Alouatta palliata) – Seen well at Cuero y Salado. Heard again in Santa Barbara. WHITE-THROATED CAPUCHIN (Cebus capucinus) – Also seen at Cuero y Salado. BRAZILIAN RABBIT (Sylvilagus brasiliensis) – A pair on our drive to Copan. VARIEGATED SQUIRREL (Sciurus variegatoides) – Singles in the lowlands around Lake Yojoa. DEPPE'S SQUIRREL (Sciurus deppei) – In the highlands at Santa Barbara. Smaller than the previous species. MEXICAN HAIRY PORCUPINE (Coendou mexicanus) – Seen at Cuero y Salado. CENTRAL AMERICAN AGOUTI (Dasyprocta punctata) – One was seen at Lancetilla Botanical Gardens. CRAB-EATING RACCOON (Procyon cancrivorus) – One in the mangroves at Cuero y Salado. WHITE-NOSED COATI (Nasua narica) – A big fat one was enjoying the life around PANACAM. WEST INDIAN MANATEE (Trichechus manatus) – A few bits and pieces of this species surfaced at Cuero y Salado.